When Galileo first turned his improved telescope with 20x magnification to the moon on November 30, 1609, he started to make a series of observations through December 18 that year. Although other people prior to Galileo, such as English mathematician Thomas Harriot, had observed the moon and noticed the dark patterns on its surface as "strange spottednesse," Galileo was the one who first understood the patterns of light and shadow were in fact topographical markers from lunar mountains and craters. Those observations led to the conclusion that the moon, a heavenly body, was not perfect, which in turn called into question about the teachings of Aristotle where the Earth was the center of the universe and all heavenly bodies, including the moon, were perfect spheres that moved around the Earth in circular orbits. Copernicus had put forth a theory that the sun rather than the Earth was the center of the universe by then. However, his theory went against fundamental beliefs of the time and was dismissed by most people. While Galileo's observations and conclusions about the moon did not give direct and solid proof of Copernicus' theory, they indeed paved the way for its eventual acceptance. 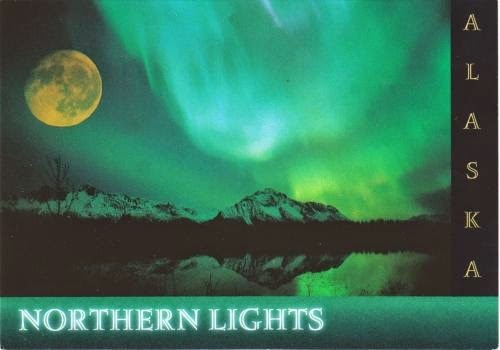 Postcard US-2373495 to Hong Kong shows a full moon and northern lights over Alaska. It was part of my Alaska collections from ASPRS 2003.